The ISOFIT technology makes the upper unit more flexible, breathable and responsive to the movements of the foot. The Support Frame locks the heel in place, making sure that slips are prevented. Runners generally appreciated the RUNDRY Collar Lining, which offers moisture wicking and security. The EVERUN and PWRGRID+ makes the mid-sole unit more robust and responsive. Runners welcomed the X-900 carbon rubber material and the Injection Blown Rubber in the outsole for more durable traction and protection. The Hurricane ISO 2 is a very flexible running shoe. There were complaints saying that the overlay system was too tight and uncomfortable. This running shoe has a high price. Some runners said that the cushioning was a bit firmer and not bouncy enough. The Saucony Hurricane ISO 2 is a stability shoe designed for road running. It is a popular running shoe because of its reliable components and responsive design. From the upper to the sole unit, any runner who needs comfort and moderate stability is well-serviced. I started running in the Hurricane ISO 2 on January 4, 2017. Since that time, I have run 248 miles in these shoes and two half marathons. I will be running another half marathon in them on April 8th. In February, I set a personal record for my half marathon time in these shoes by running a 1:53:32, and I am hoping to gain another personal best again in these shoes in my next race. For the last three years, I have ran in a variety of assorted styles of Saucony shoes. Prior to this shoe, I was running in the Triumph ISO 2. As I continue to grow as a runner, I continually find myself turning to Saucony shoes because of their comfort and support and the Hurricane ISO 2 proves to be no different. Over the past two months, I have found these shoes to be durable and supportive. I see a lot of wear in my running shoes on the heels, and so far, the wear on soles are just minor. The EVERUN Landing Zone and evenly distributed EVERUN cushioning, provide me with great comfort and support that my feet and legs need for optimal running. Since I started running in these shoes, have not had any heel or leg pain. Another thing that I like about these shoes is that I never worry about foot stability because the ISO fit really forms to your feet and keeps them in place. Lastly, to basically have 250 miles completed in these shoes I am impressed by how durable they have been. 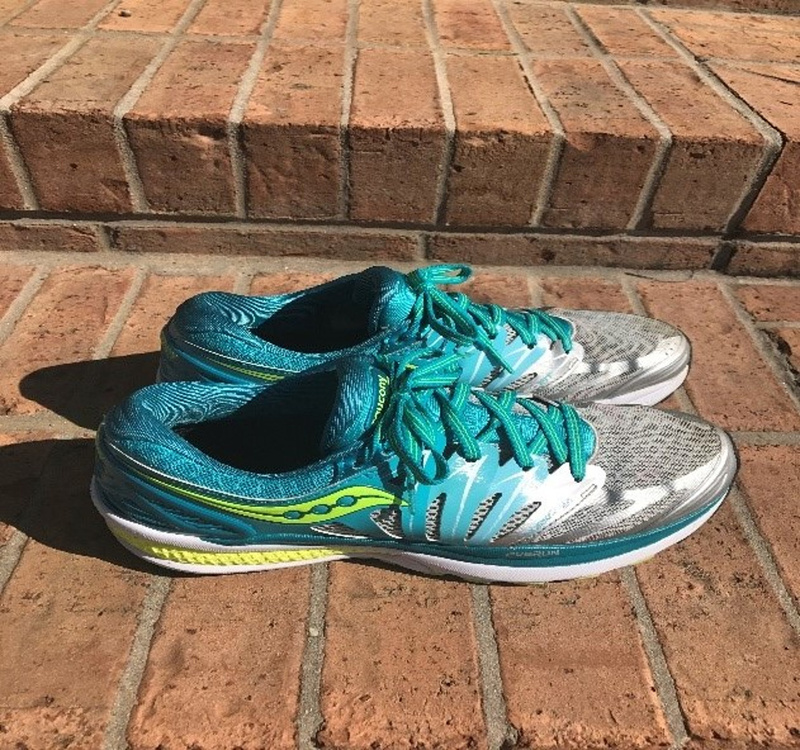 In previous models of the Saucony Kinvara, by the 300-mile mark, I have had wear and tear in the upper lining of the shoes. So far, these shoes still look new, and there is no evidence of stretching or tearing in the upper lining at all. After running in these shoes for two months, there are only a couple of negatives that I have found. One thing that I have noticed is that sometimes after being tied, these shoes feel tight on the top of my feet. Therefore, I find myself adjusting the tongue and loosening the laces at times. On a positive note though I never worry about these shoes coming untied mid-run (the laces stay tied from start to finish). Another negative that I find with these shoes is the price. They retail for $160.00 which may be a little steep for some individuals; however, I am confident in the Saucony brand are willing to pay the price for these shoes. As I mentioned before, I have always been a Saucony fan, and I have run in the Triumph ISO 2 previously. I was drawn to the Triumph ISO 2 because it was featured as an Editor’s Choice in Runner’s World and I ran through three pairs of this style of shoe. Before I began running in the Hurricane style, I was curious as to how the Hurricane and Triumph compared to each other because they both seem to favor quite a bit. Based on my experiences, I have found that the Hurricane and Triumph both are similar in some of their features. For example, they both have the ISO Fit which provides your feet with a custom fit, and both offer EVERUN and 8mm offset cushioning. However, with their similarities also come differences. I have found that the Triumph ISO 2 is made more for the neutral runner and is focused more on comfort and cushioning. Whereas, the Hurricane ISO 2 focuses more on stability and offers the heel support and frame of the back of the shoe. It serves as a great shoe for the moderate to severe pronator and with someone who has a normal to low arch. After running in both shoes, I have found the I benefit more from the Hurricane ISO 2 because of the support and stability that it provides me in the heel. To conclude, the Saucony Hurricane ISO 2 is a great option for runners looking for a shoe that provides stability. 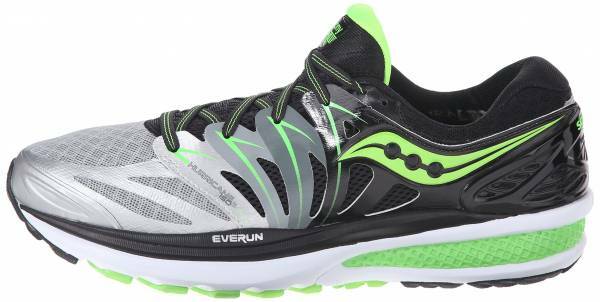 The support and frame on the back of the heel is one major advantage to this shoe compared to some of the other Saucony models. This shoe offers runners a secure ride, along with comfort provided from the 8-mm offset cushioning and EVERUN technology. Lastly, it is a durable shoe for road and track running that will easily take the beginner or experienced runner through 300 miles or more. So far this has been my favorite Saucony thus far and one that I will purchase it again in the future. It has maximum cushioning while offering a nice amount of medial support for the overpronator. It's a bit softer than its predecessor, but still nice, stable, and comfortable. The first model of the Saucony Hurricane ISO shoe was awesome. The latest model of this continues the tradition of the Hurricane. This model is lightweight, responsive, and has a number of great color options to choose from. The Saucony Hurricane ISO 2 comes with an updated outsole unit. It uses technology that allows an increased distribution over a larger surface area. It offers optimal traction and flexibility. The midsole of the Hurricane ISO 2 was also updated. It comes with a durable cushioning for a smoother landing and maximum impact protection. Another notable update of the shoe is the improved ISOFIT upper that offers a comfortable fit and added support at every stride. Just like the original version of the Hurricane ISO, the 2nd version has a standard shoe length. The heel, forefoot and midsole have standard measurements. Those who have tried and found a great fit with the original model will experience the same fit with this version. This shoe uses the Sauony’s XT-900 outsole technology. This carbon rubber material was placed in the heel for a durable traction. The IBR+ element found in the shoe’s outsole is a lightweight material that is highly flexible. It offers an added cushioning and a much responsive ride. The new TriFlex technology of the Saucony Hurricane ISO 2 works well with the shoe’s EVERUN technology. It offers a smoother ride and better ground contact. The midsole unit of the Hurricane ISO 2 features the EVERUN Topsole technology that is highly durable and offers and efficient energy-return properties. Through its responsive cushioning, runners can experience an energized running with every stride. Working hand-in-hand with the EVERUN topsole technology, which is also present in the Saucony Hurricane ISO 5, is the EVERUN Landing Zone that is strategically places in the shoe’s heel area. It provides smoother landing and lessens ground impact for a lively and flexible ride. The PWRGRID+ technology in the shoe’s midsole is 15% more resilient and 20% more cushioned than the regular POWERGRID. Thus, the shoe delivers a plush feel, impact protection and responsive ride. The stretchable construction of the shoe is possible though the ISOFIT technology. It adapts to the foot’s natural shape for an ultra-soft and sock-like fit. It also provides added stability support. The RUNDRY Collar Lining of the shoe offers an impressive moisture wicking properties to keep the foot dry and comfortable. The upper of the Saucony Hurricane ISO 2 has a support frame that delivers a molded support, locking the heel in place for a more stable and secure fit.